WASHINGTON, D.C. -- When asked to choose which of the two major parties can better protect the U.S. from international terrorism and military threats, Americans favor the Republican Party over the Democratic Party, 51% to 38%. Americans also tilt toward the GOP when asked which party can better keep the nation prosperous: 46% choose the Republicans and 42% the Democrats. Despite this GOP edge on military threats and prosperity, recent research shows that Americans have a significantly more positive image of the Democratic Party overall than of the Republican Party. The Democratic Party thus faces a continuing challenge of how to translate its more positive image into public confidence on domestic and international challenges facing the nation. 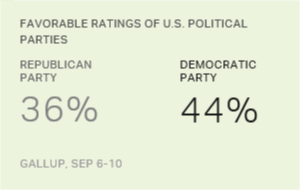 These data come from the latest Gallup poll conducted Sept. 6-10, as observers are increasingly focusing on the future of the major parties. Time magazine's Oct. 2 cover story is headlined "Shrunk. Democrats are in their worst shape since 1929. Can anything save them? ", highlighting the problems the Democratic Party is experiencing in developing a strong positioning and policy brand that would help stop the trend toward GOP control of state legislatures, the U.S. Congress and the presidency. 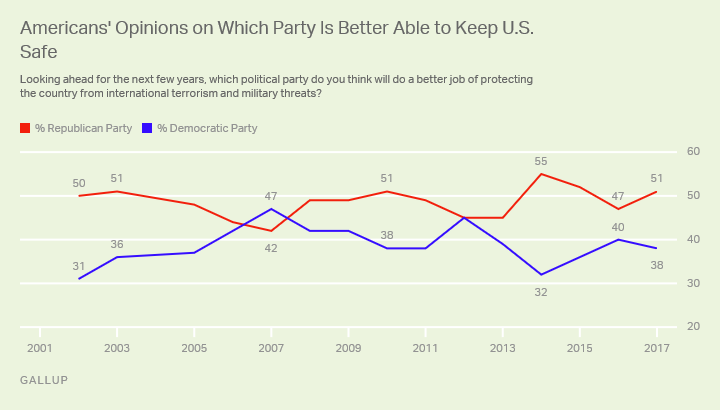 The Republican Party has outperformed the Democratic Party as best able to keep the country safe from international terrorism and military threats in 13 of the 15 years that Gallup has asked the question. One exception came in 2007 when broad public dissatisfaction with the war in Iraq and the Bush presidency resulted in a five-percentage-point advantage for the Democrats. Another occurred shortly after the Democratic National Convention in 2012 when the party ran even with the Republicans on this issue. After seeing their advantage dip to seven points last year, the Republican Party has regained strength on this question and is now favored by 13 points. Historically, Republicans have backed their own party in higher numbers than Democrats have theirs on the military threat question. Currently, there is a 10-point difference between Republicans (92%) choosing their party and Democrats choosing theirs (82%). Political independents have rated the Republican Party as better on security matters every year except for 2007 when they split their support evenly between the two parties. 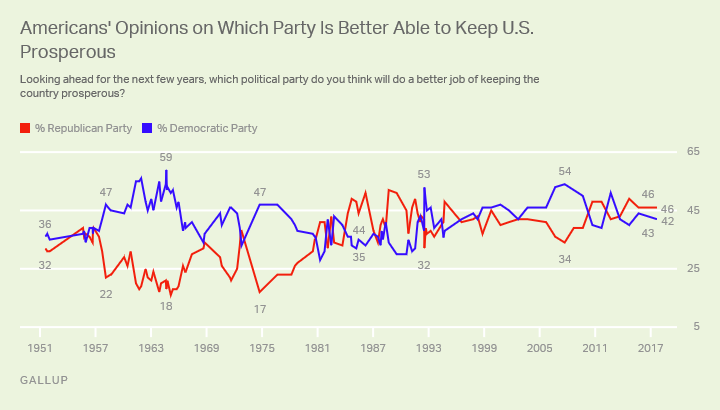 Gallup's trend question on keeping the country prosperous extends back to the Truman administration, with Democrats mostly outpacing Republicans on this measure from the 1950s until 1981. Since then, the party winning on the issue has varied, with the Republicans maintaining an advantage throughout Ronald Reagan's and George H.W. Bush's presidencies, and the Democrats ahead during most of Bill Clinton's and George W. Bush's presidencies. Since Barack Obama's second year in office, the Republican Party has been at least slightly favored over the Democratic Party every year except 2012. Republicans and Democrats often choose their party as better for prosperity in roughly equal numbers, and political independents have favored the Republican Party consistently since 2013. Republicans have consistently been better positioned on the terrorism and military threat dimension over the years, while the party's current edge on prosperity coincides with Trump's relative strength on handling the economy. In recent years, Republicans have been able to gain advantages in state legislatures, the House and the Senate, and the White House. Some of the explanation for this electoral strength centers on structural factors such as congressional districting, higher turnout among Republicans in midterm elections, and the Electoral College system. But it may also reflect the perception that the Republican Party has better solutions for two of the crucial issues of the day -- terrorism and military threats and prosperity -- than does the Democratic Party. The Democrats have a more positive overall image, and research from a June Gallup poll showed the Democratic Party with a double-digit advantage as the party better able to handle the environment, discrimination against minority groups, healthcare policy and education. The Democrats' more positive overall image may reflect its relative strength on cultural and racial issues, or its underlying advantage in party identification. However, the party's image advantage alone has not been enough to counter the GOP's electoral success. Based on the current findings, Democrats' current political malaise -- as measured by their deficit in control of state and federal government -- would benefit from a rebranding based on developing more specific proposals or emphases on handling terrorism and military threats, and on keeping the nation economically prosperous.